In an unashamed show of hypocrisy, I’m transitioning from a post about pondering the possible benefits of a Peter Parker/Carlie Cooper long-term team-up to bemoaning the fact that in recent years, Marvel has seemingly shoehorned Spider-Man into every superhero supergroup possible. This is certainly not the first time, nor the last that I’ll make this complaint, as there’s been no indication that Marvel is planning on giving Spidey an exit from either The Avengers or the Future Foundation/Fantastic Four any time soon. However, I thought I’d reach back to the 1960s to give my argument/whining/nerdy rant a foundation – namely Amazing Spider-Man Annual #3. 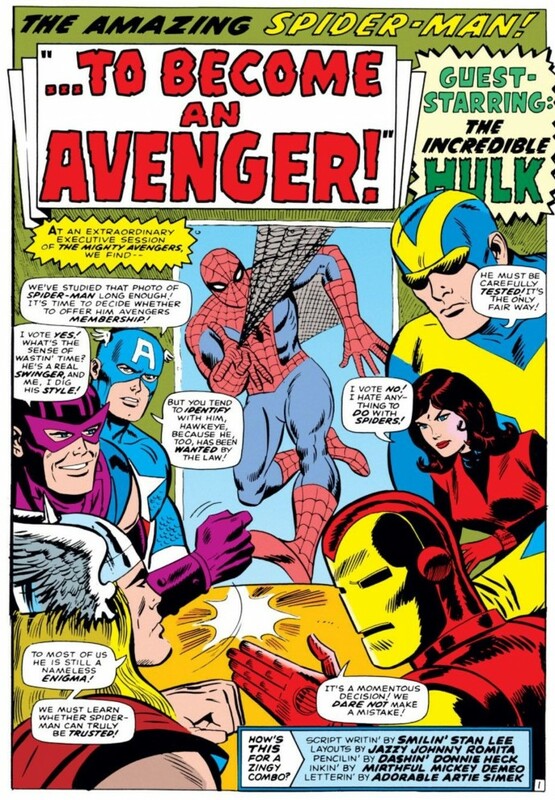 Talking from a strictly pragmatic point of view, one of my biggest issues with putting Spider-Man on The Avengers and the FF is that it seemed physically impossible that the character would have the time for all of those adventures. Seriously – he was working as his own independent crime fighter, holding down a job at Horizon Labs, having some semblance of a social life, and then tacking on global threats with The Avengers and traveling to alternative dimensions and fighting multiverse version of Reed Richards with the Future Foundation. Last I checked, Spidey never had the power to slow down time or add days to the week, so I honestly have no idea beyond the age-old “suspension of disbelief” excuse how he really can be doing all that he can be doing. But it’s a comic book, so of course suspension of disbelief comes into play. Honestly, if it was just a question of “how much time can Spidey actually spend supporting other heroes,” I don’t think putting him with The Avengers or FF would be so curious. Instead, looking back to ASM Annual #3, and the story pretty much spells out for readers why the concept of Spidey joining these other groups defies what the character was originally all about. 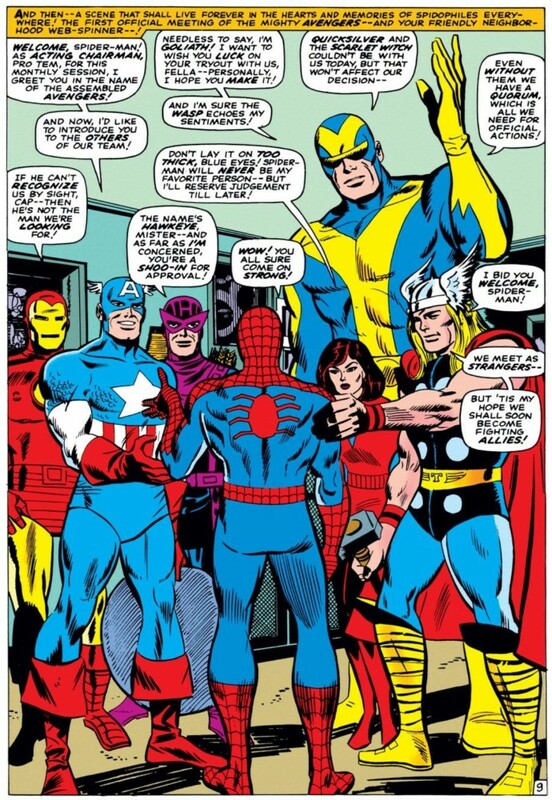 In Annual #3, The Avengers meet-up to discuss adding Spider-Man to the ranks. They have a lot of question about his character and make-up – being an Avenger isn’t just something that can be taken lightly, you see. 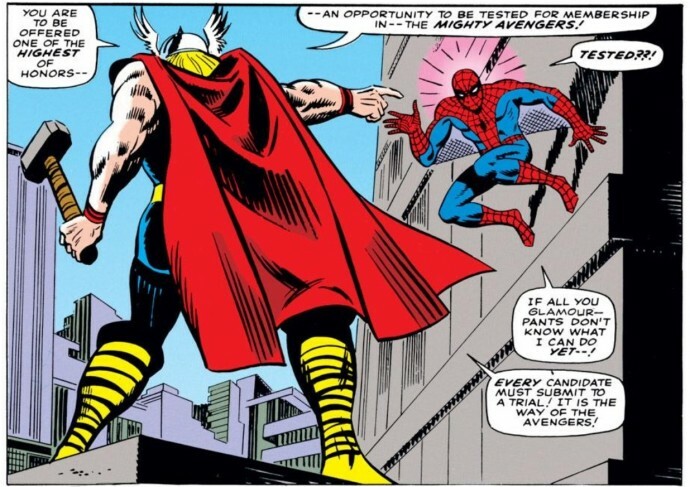 However, despite the potential offer being sold to Spider-Man as an honor that could transform his career as a masked vigilante, Spidey ultimately rejects the offer, and for good reason. During the original Stan Lee and Steve Ditko run of ASM, and traversing into the period were John Romita Sr. and other subsequent writers and artists took over, Spider-Man was portrayed as a loner. Because of the personal issues he’s had with his family – remember, Peter Parkers vows to use his superpowers to fight crime because he believes it’s his own fault that his Uncle was murdered – Spider-Man doesn’t allow himself to become too close with many other people – superpowered or not. He views his role as a hero as one that comes with great personal sacrifice. He also believes he needs to protect his family, most notably his Aunt May, first and foremost. 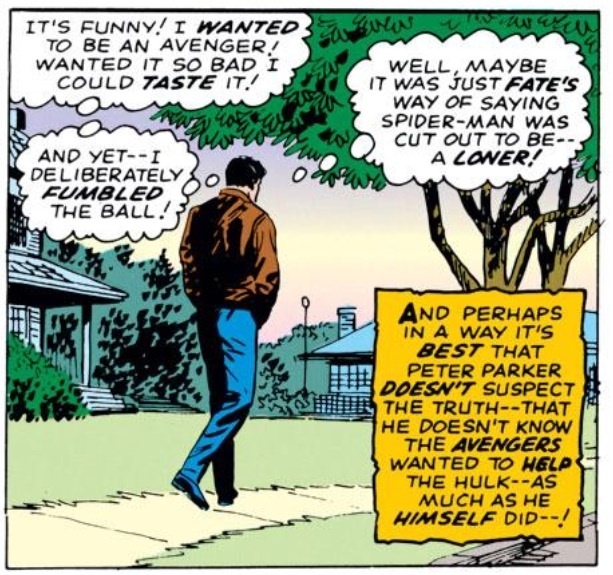 When Peter is initially faced with an offer from The Avengers, he thinks about how it might raise his profile within New York City, but then weighs that positive against the fact that he would be at the back and call of another batch of heroes. He bemoans the idea of being called out on other people’s missions when he instead should be taking care of May or studying for school. 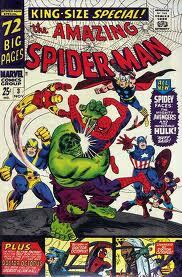 And above all, maybe the biggest issue Spider-Man has with joining the Avengers comes down to ego. Under the mask, he may be Peter Parker the wallflower, but as Spider-Man, he’s brimming with confidence and empowered by his superhuman abilities. When it comes to facing down dangerous foes like Doctor Octopus and the Green Goblin, Spidey has proven that he can take care of the hard stuff on his own. It’s also worth noting that at the time, and arguably to this day, Spider-Man is one of the most unique superheroes to ever exist. And don’t think Peter is not aware of that. By joining a supergroup, he’s ceding his individuality over to other people who may not have the same priorities as he does. That’s why he rejects their offer. Grated, times change. Peter has matured enough that he doesn’t necessarily crave the attention that comes with be a lone-vigilante who doesn’t need the support of others. For years, Marvel produced a comic book series, Marvel Team-Up that focused solely on pairing Spider-Man with another hero. While not an official member, Spider-Man has aided, or been aided by the Fantastic Four or The Avengers on countless missions (though where were those guys when he was taking on the Juggernaut?). On the personal side, Aunt May is married now, and is rarely portrayed as the constantly ill, always in need of her nephew elderly woman that she was during the Lee/Ditko years. So perhaps enough has changed with Spider-Man the character that officially joining these groups is no longer as offensive to him as it once was. Yet all the same, as a reader, I find myself more emotionally attached to the unique, one-of-a-kind, idealistic superhero that’s much too larger-than-life than to permanently team with other superheroes. And besides, it would afford Spider-Man a few extra hours in the day if he could just take some time away from The Avengers and Future Foundation for a while. I haven’t finished the article yet, so forgive me if you already addressed this, but Spider-Man was NEVER a loner. Sure, they SAID he was a loner, but he never was. Well, perhaps in Amazing Fantasy. Think about Spider-Man #1, you know, when he tried to join the FF. Then, he teamed up with Dr. Strange. And Daredevil. And the Hulk. And the Human Torch. All this was in the Ditko days. And then, he started appearing in a book called goddamn Team-Up! He flirted with a Robin of sorts with Black Cat. Even his social life was filled up: Harry, Flash, Liz, Gwen, Betty, etc. I doubt Spider-Man spent 10 minutes alone in his entire life. If there’s one hero who’s even more of a loner than Spidey it’s Batman, yet he wound up on the JLA, with his own team-up book, with a buddy book with Superman and a title devoted to his spin-off heroes… all at the same time. 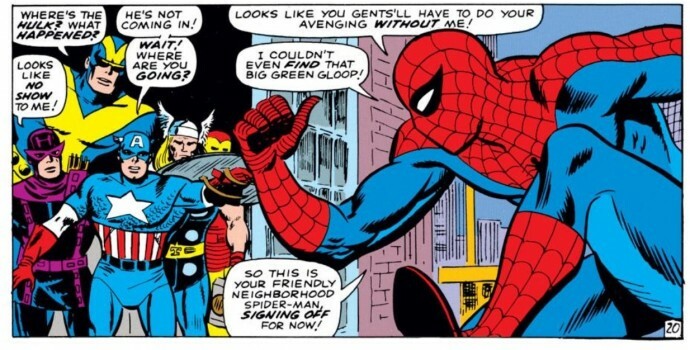 I think this did change somewhat as time went on – in the 1960s most of Spidey’s guest appearances see him on tense terms with the resident hero and very easily losing his temper. In the 1970s that lessens a lot but there’s still a strong degree of tension with many heroes and he’s especially bad at falling in line behind established leaders. Oddly though he did hang around the Defenders long enough to be whatever qualifies as a member of the non-team. By the 1980s even this is fading so come Secret Wars and he has no problem falling in line behind Captain America – and staying loyal when first the X-Men and later the Fantastic Four go their own ways. After that you get a lot of events where Spidey is frequently relegated to a small part at the back of the crowd but he easily accepts the authority of Captain America, Doctor Strange, Mr Fantastic or whoever’s emerged as the overall leader.